It’s a common misconception that teachers lead very drab and boring lives. After all, someone who spends his or her life pontificating about the pleasures of drawing graphs or writing essays cannot possibly be doing anything interesting in his/her spare time, can they? 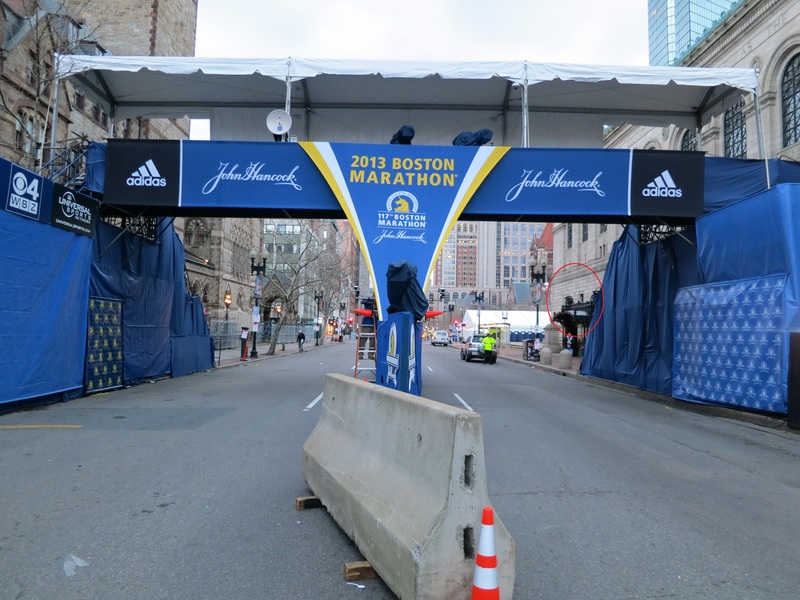 Ms Lin Run’Er, our very own Year 5 GP tutor, showed us just how wrong we were on 15th April, when she witnessed the scene of the Boston Marathon bombing first-hand. Having taken leave from the school to take part in the marathon, she was barely 200m away from the bombing when it took place. 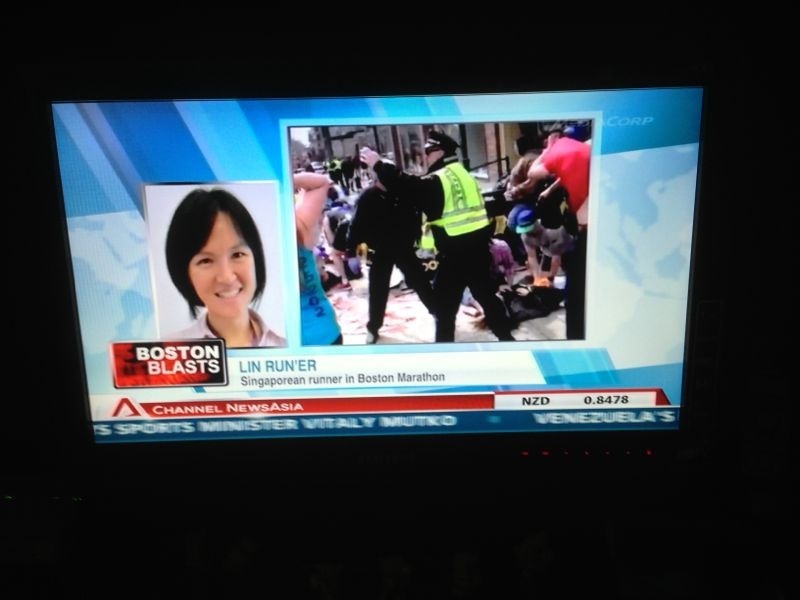 Ms Lin appearing on the news after the incident. In light of her remarkable experience, we sat down with Ms Lin to obtain a first-hand account of what transpired in Boston as well as her personal take on the incident. Press: Let’s start at the beginning, before you went for the marathon. 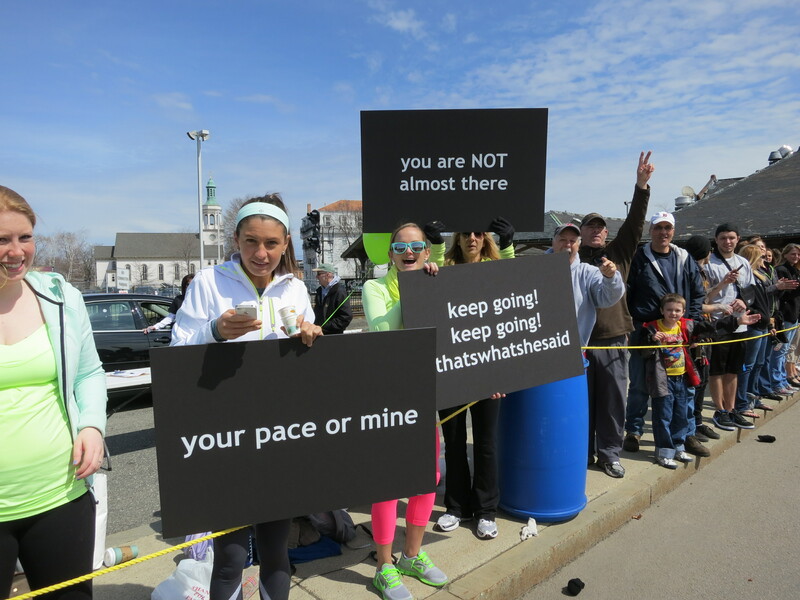 How did you qualify or get to participate in the Boston Marathon? Ms Lin: Well the qualifying timing for my age group was 3h 35 mins, so we had to run a marathon in 3h 35 mins or less. I qualified in the 2011 Singapore Standard Chartered Marathon. I ran 3h 33 mins. 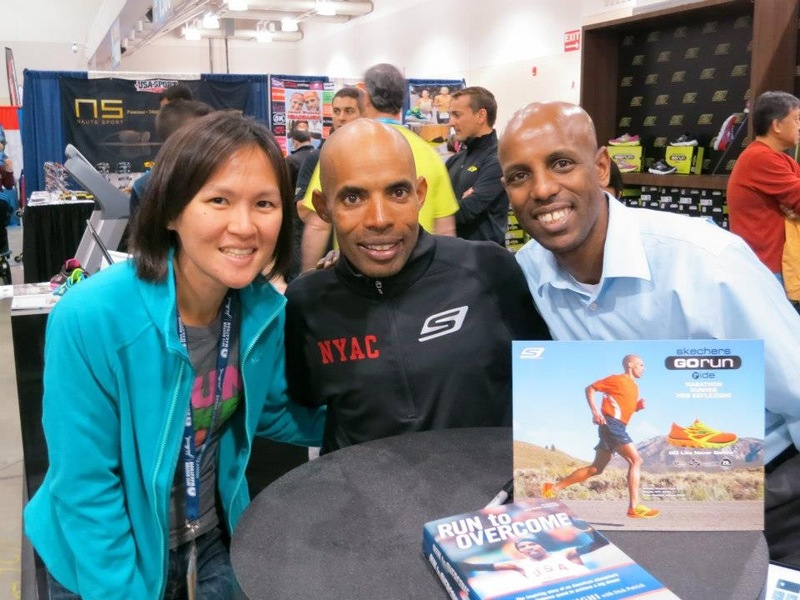 What made you decide to go to the Boston Marathon in the middle of your teaching season? The Boston Marathon is a really big deal for runners. They call it the “Olympics of the Common Man” and I’ve heard a lot about the Boston Marathon. I’ve had friends who’ve went, and they’ve said it’s the oldest marathon in the world. I mean, besides the one that happened in Greece, it’s the oldest “official” marathon in the world so it’s something I wanted to experience. My qualifying time only lasted for a year or so and I really wasn’t sure if I could qualify again. They recently tightened the qualifying standards; it used to be 3 hours 40 mins but now it’s 3 hours 35 mins. So, before they tighten the qualifying standards again, I thought “I’d better go just once, while I have a chance to go” and I know it’s in the middle of my teaching season, which I why I took a very minimal amount of leave, just enough to fly there and back. During the marathon itself, how did you find the route? How did you feel while running the marathon? It’s really, really good. It’s the best marathon I’ve ever run. Because the level of support there is tremendous, all the volunteers are super enthusiastic. I’ve never seen such a level of enthusiasm before. I mean, I’m not putting down Singapore or anything, but you could really see that all the volunteers were really happy to be there. The residents, they take pride in staying there. They will come out of their houses to watch, it’s a family event. People will drag their sleeping bags out, they will lie on the field and support the runners. They will mix their own drinks and even buy their own ice-cream and offer it to runners. They also make their own signs and posters – some are really creative. It was a very enjoyable experience. There were supporters along every part of the route, so for the whole 42 kilometres there were supporters. Any particularly interesting signs or incidents that happened to you? One of the posters said “You’ve trained for this longer than Kim Kardashian has been married.” Things like that. Where were you when the bombing took place? I was after the finish line, roughly about 200m or so past it. What was your initial reaction to the bombing? What did you see at the site? My initial reaction was like “What is this? What happened?” Because those of us who finished the marathon, we were all very tired, so our reflexes were a bit slow. It was a new place, and there was a church there so we thought it might be a celebratory cannon or fireworks that went off early. There was no immediate panic. We just went like “Oh my goodness, what was that”. Everyone was in a very happy mood, you see, so it didn’t really strike us immediately that it was a bomb. So we just went on as per normal. Some people stopped to take photos. We just thought “There’s nothing we can do, we don’t know what it is.” Just a few moments later, people started running in our direction. They were panicking, saying “Run, there’s a bomb”. Did you actually see the site of the bombing? We couldn’t go to the site of the bombing. I was about 200m away, but after that the area was cordoned off and we were not allowed into that street. How did the general public react to the bombing? On that same day, I saw very distraught people on the streets. It was very heart-wrenching to see that, especially because a few thousand people didn’t finish the marathon; they couldn’t access their phones so they were uncontactable. So, these are the people whose relatives were trying to contact them but to no avail. People were even offering their houses out to people. There were a lot of tourists over there as people had flown in from overseas to participate so people offered their houses for them to stay at. I heard that people immediately went to the hospital to donate blood. How did the bombing affect you personally? We understand that your hotel was in a cordoned off area. Personally, there was a lot of inconvenience as I couldn’t get back to my hotel or get a change of clothes. My passport was in my hotel, a lot of my things were there. I had to stay in a separate Bed and Breakfast for the night, and there was a lot of uncertainty because I was supposed to be flying off the next day. But I mean, to keep things in perspective, it didn’t worry me that much. I knew that it was an emergency, there was a crisis. I can’t get back to my hotel, okay, but that’s a minor problem compared to what had happened. Were your family and friends worried? Were you? Well, I was worried that they would be worried. I think it wasn’t that bad, because I managed to contact them and inform them pretty early. It was at 3-4am Singapore time, so most Singaporeans were sleeping at the time. I think they didn’t know about it yet, so I thought I should pre-empt them and tell them what had happened and tell them that I’m alright. Do you think it’s possible that something like this might happen to Singapore in the future? In Boston, do you think there were sufficient security measures put in place? If you talk about security measures, frankly speaking in this kind of event I’m not sure if security measures are good for the event. It’s a family event; if we were to start instituting security measures, like checking everybody’s bags or limiting supporters, I think it would be very difficult. Like for example, in Singapore, there was a race on the Thursday after the Boston Marathon. They decided to limit the number of supporters, and they did not allow supporters in the event area. As to whether it can happen to Singapore or not, I think it can happen to Singapore. There have been bomb plots that have been exposed so it is possible. On a lighter note, how many other marathons have you run? This was my tenth marathon. How did you first develop your passion for running? I guess I first picked up running in secondary school. Since then I really liked running, and in Singapore this whole marathon trend is catching on. Best marathon timing so far? Not at the moment. Qualifying for Boston was a major goal. Now that I’ve achieved this goal, in the immediate future I don’t see the need to aim for another better timing. After this whole incident, are you looking to participate in any future marathons? Of course! I think a lot of people expect me to say that I’ll never run another marathon again. But of course not, this won’t affect my future decisions in taking part in more marathons. Any final thoughts about this entire incident? I also saw the importance of a sense of community in a city. People in Boston are really very friendly, they’re very proud to be part of the community. When this happened, it seemed natural that everyone just started helping one another. And I was wondering – if this happened in Singapore, how would Singaporeans respond? I mean, of course, I don’t want to wait until there is an emergency or disaster to find out. It’s just something to think about. Photos courtesy of Ms Lin. By Claire Yip. Last year, in the middle of my term at Raffles Press, I stopped believing that we could make any real change to the culture of discussion and honesty in the school.